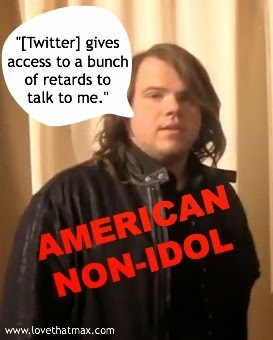 Last week, American Idol finalist Caleb Johnson dropped the r-word bomb during an interview with AfterBuzz TV. As he now infamously said (minute 1:36 in the video below), "[Twitter] gives access to a bunch of retards to talk to me. I don't really enjoy having to see somebody telling me what song I have to sing...."
Parents of kids with intellectual disability were offended, like Mark Leach over at Down Syndrome Prenatal Testing; his daughter, Julie, is one of Caleb's fans and has DS. As he wrote, "Since she was born, I have dreaded the day she's at school or is out with her friends, and someone calls her that word." Meanwhile, in the so-called apology Caleb posted on Facebook he clarified that he didn't mean to direct that "juvenile comment" to his fans but, rather, to the "wackos that send hundreds of hate messages to me a day.... Sorry if it offended anybody it was the wrong choice of words." More and more people are understanding why using the word "retard" as a synonym for "loser" or "stupid" degrades people with intellectual disability (ID) and also offends those of us who love them. 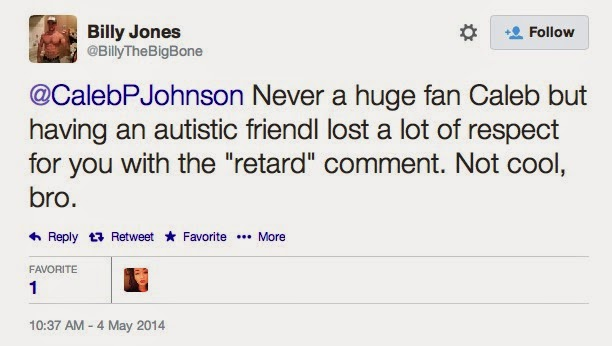 As another dude on Twitter wrote, "Never a huge fan Caleb but having an autistic friend lost a lot of respect for you with the 'retard' comment. Not cool, bro." Still, there are plenty of people who don't get it—like Caleb, who thought his only mistake was accidentally insulting his fans. Or the fans who were incensed only because they had been insulted. @Taithleach above continued to tweet comments like "Maybe @CalebPJohnson's fan base should be switched to the Retards because that's what he thinks his fans are." His audience took it personally—when, in reality, Caleb's name-calling was more hurtful to people with cognitive impairment. The careless use of the word perpetuates negative stereotypes of people with ID, and makes them seem like lesser human beings. As if they don't already have enough societal challenges to overcome. The term "mental retardation" is outdated (and is no longer included in federal laws and many state ones) because "retard" and "retarded" have become pejorative. Teens and adult who sling those words around, whether in real life or on social media, demean an entire population of people. 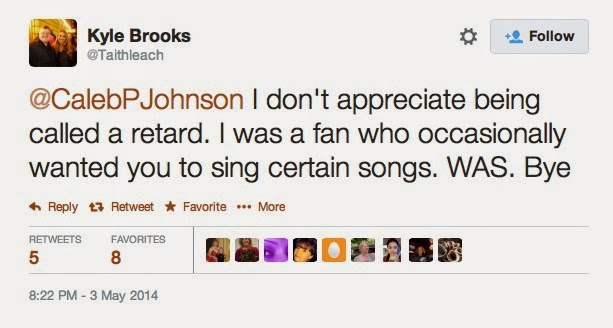 And that's far more troubling than one obnoxious American Idol contender slamming his fans. Really, really hate that word. Glad the community quickly brought his poor choice of wars to light. There's simply no excuse. Interesting about 'mental retardation'... about 2 months ago I signed a document for Lizzy that had 'Mental Retardation' listed in the heading on the form. Yes, I've seen it on forms, too—some medical professionals haven't yet got the memo. I always let them know that it's a defunct term that's been replaced by "intellectual disability." Thanks, Ellen, for the link to my blog piece on this. As I ask in my post, I hope Caleb uses the platform he has on live TV to take the pledge to end the "r-word." That would be a remarkable positive out of a negative.